Field care is the first step in preserving an animal so that the hunter can cherish it for a lifetime. 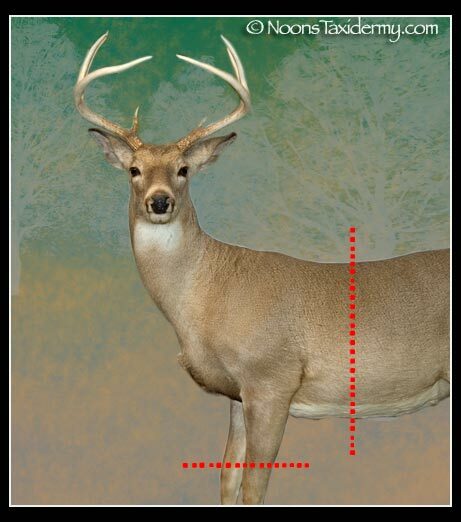 Using the pictures provided below, of a full body whitetail deer mounted by Noon’s Taxidermy, can help in ensuring that your trophy is properly taken care of. 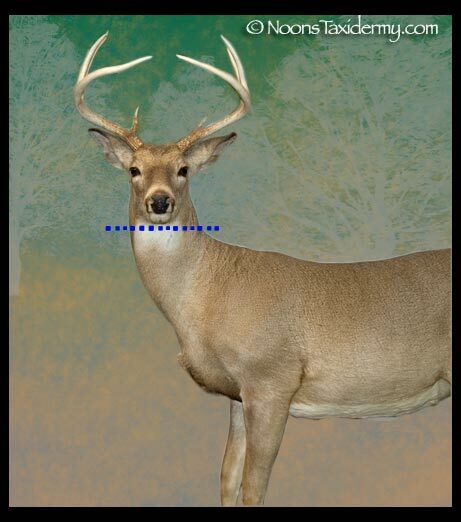 The next photo shown has a blue line representing where the neck meat and spine should be separated after the hide as been peeled down. When removing the head and hide from the rest of the carcass be sure not to cut any of the hide. Never cut the throat on any game head that you plan on having mounted. After the head and hide are separated from the rest of the carcass, bring it to Noon’s taxidermy as soon as possible. The longer that the hunter waits, the more likely it is that the trophy will spoil, causing hair loss. If it is not possible for the hunter to bring the trophy to the taxidermist immediately, freeze the trophy in an air tight bag to ensure that all of the trophy's features will be preserved.